Luis Valentino: District Leader Podcast in LIVE! 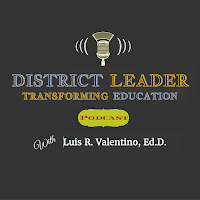 The District Leader: Transforming Education podcast is LIVE on iTunes, and ready for listening. District Leader is a podcast dedicated to highlighting leaders in public education from across the country. Each week, I interview superintendents who share their inspiring stories. District Leader is a podcast about moving and inspiring educators and non-educators alike to believe in the power of education, its leaders, and its transformation. Informing the District Leader interviews are 3 important pillars: Scholarship, the concept that we are forever learning, Leadership, the concept that we are able to move and inspire people into thought, feeling, and action, and Agency, that we empower those we serve.